It took 69 years, but Shirley Shapiro finally got the accolade she has wanted ever since she was a 21-year-old college student. Shapiro, 90, became an official member of Mu Phi Epsilon fraternity Nov. 2. The ceremony took place in her West Concord home, Wicked Local reported. Shapiro was a music student at Boston University in 1948, and was asked to join the music fraternity. She very much wanted to make it happen, but rejected the offer when she discovered African-Americans were barred from joining the BU chapter. “Who wants to join a group like that?” Shapiro said, recalling the stand she took in 1948. 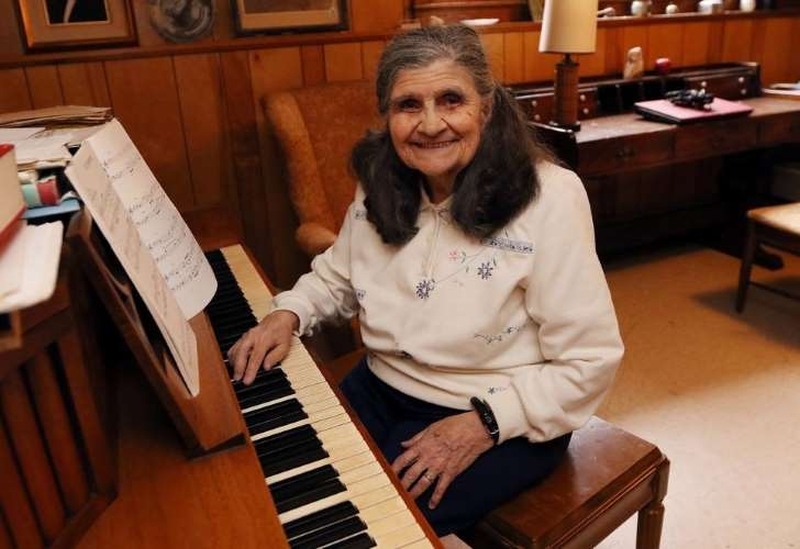 Rosemary Ames attended the Nov. 2 ceremony in Shapiro’s home. Ames is the international president of Mu Phi Epsilon. According to its website, the fraternity was founded in 1903 as a sorority for women to advance the cause of music in America. It currently has 128 college chapters, 74 alumni chapters and more than 75,000 members. It became a coeducational music fraternity in the 1970s to comply with federal regulations, including Title IX. Ames said she researched the fraternity’s historical documents that date back to the early 20th century, and found no evidence of discrimination. However, given the civil rights struggles in the 1940s, Ames said it’s possible the BU chapter limited its membership. According to Ames, Mu Phi Epsilon today has many chapters at what are historically all-black colleges. Mark Shapiro was the driving force behind Shirley finally getting her wish. Shapiro is Shirley’s nephew, and said he had no idea until recently of the civil rights stand his aunt took nearly 70 years ago. “Blown away” is how Shapiro described finding out the story, and he decided it was time to take action. He reached out to Ames, and the rest is history. “It was an opportunity to repay (Shirley’s) kindness after all those years,” Shapiro said of the role his aunt played as his mentor. Today, Shapiro is a music conductor and teacher. Shirley had a second chance to join Mu Phi Epsilon after graduating from BU. Her husband, Jacob, was in graduate school at the University of Rochester, and Shirley discovered the school’s chapter had an open membership policy. However, she didn’t have the time to practice for the required recital. Shirley and Jacob started a family, and with a young child in the picture, Shirley knew she couldn’t put in the hours necessary to ace the recital. When Ames called to say membership was a possibility, Shirley jumped at the chance. “I said, ‘Sure…everyone’s welcome. There’s no more discrimination,’” Shirley said. Ames was one of five fraternity members who awarded Shirley a membership badge Nov. 2, and an official certificate has been ordered. After 32 years of teaching second and fourth grades in the Boston Public Schools, and raising two children of her own, Shirley is now an official member of BU’s Phi Upsilon chapter of Mu Phi Epsilon. It only took 69 years to make it happen. “We’ve given her something she’s wanted for a long time, and it was a pleasure to do so,” Ames said.